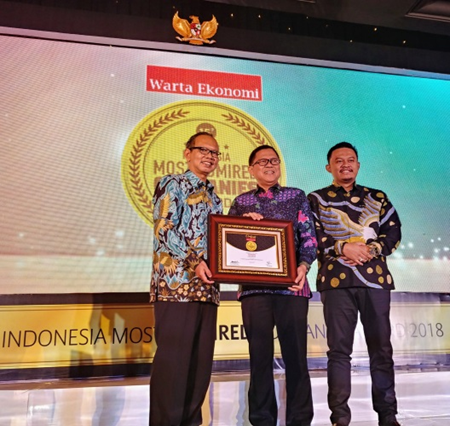 Jakarta - Warta Ekonomi once again held the annual awarding ceremony of Indonesia Most Admired Company 2018 held at Hotel Mulia, Jakarta on Wednesday, May 9, 2018. Indonesia Most Admired Companies (IMACO) Award 2018 is a form of appreciation Warta Ekonomi to companies that have good image based on research according to the respondent's perception. PT Toyota Motor Manufacturing Indonesia (TMMIN) once again been awarded Indonesia Most Admired Company 2018 in the Excellent Innovation Image in Automotive Sector category received by Teguh Trihono as General Manager of External Affairs Division TMMIN. This award is the fourth award of Indonesia Most Admired Companies (IMACO) received by TMMIN since 2015. This award is given to TMMIN for the success of TMMIN in maintaining good image as a company that always innovate in the development of automotive industry. With this award TMMIN is expected to consistently continue to innovate in supporting the development of the automotive industry and contribute through real work to the Indonesian nation.